Based on the responses we get, MEN OF MYSTERY readers just can’t get enough of Everett M. Arnold’s Quality Comics material from the Golden Age, so we’ve put together ANOTHER all-Quality special, highlighting this top-shelf purveyor of comic book action from the 1940’s. The star of this issues’ awesome Lou Fine cover, UNCLE SAM leads off the proceedings with a tale originally published in National Comics #33; an election-themed story titled “Mobtown, USA”, followed by an untitled John Cassone BLACK CONDOR saga from Crack Comics #25, a classic Al Bryant-drawn CAPTAIN TRIUMPH, George Brenner’s antideluvian masked adventurer The CLOCK, a Reed Crandall- illustrated episode of The RAY, AND one featuring SAMAR; Fred Guardineer’s TOR, and QUICKSILVER- and that’s only the beginning!! This issues’ special feature hones in on DOLLMAN, one of Quality’s BIGGEST stars ( no pun intended)! MOM 101 will present no less than SIX FULL DOLLMAN dramas, running across the chronological spectrum of the character’s 14-year run, starting with three early Lou Fine-illustrated gems, a Reed Crandall classic from Feature Comics #45, another top-flight Crandall opus from ten issues later, moving on to an iconic Al Bryant-rendered story pitting him against the masked menace of Mr. Curio from Feature #122. Being barely six inches high never looked so good!! 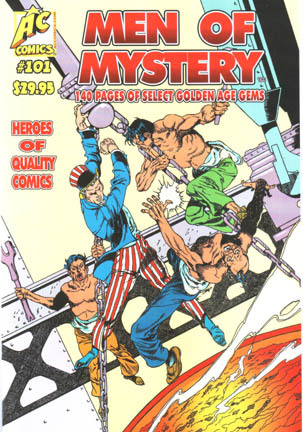 Of course, introducing Golden Age characters that have NEVER been previously reprinted at AC has become a MEN of MYSTERY tradition, and we are NOT about to let #101 break that skein, so this issue we throw in ALIAS The SPIDER; Paul Gustavson’s costumed bow-wielding crimefighter, and the INVISIBLE HOOD, Art Pinajian’s early Smash Comics star. If you’re a Quality Comics mayven that loves those spectacularly- drawn stories, you can’t miss this one. Old-timers say Quality paid their artists and writers THE HIGHEST rates in the 1940’s, and that kind of budget showed up in the level of the work that ended up on every page of their comics. MOM #101 will be yet another testament to that. 140 pages of full-story, high-quality black andwhite reprints inside of four-color covers; standard comic-book size, and saddle-stitched. Coming from AC Comics in July, 2016.